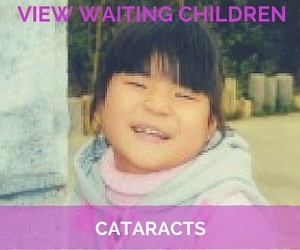 Cataracts are uncommon in children, but occasionally a child is born with cataracts or develops them early in life. Cataracts appear as a white cloudy film over the pupil and/or iris and can vary in size. Small cataracts may not impair the child's vision at all, but larger ones can completely obscure a child's eyesight. Children from orphanages often go untreated for this impairment. Children with cataracts often complain that they feel something scratchy in their eyes, or they have difficulty seeing normally. Sometimes corrective lenses are enough to overcome visual disturbances caused by cataracts. Quite often, surgery is performed to remove the cataract entirely. This surgery relies on the assistance of an ocular scope and takes place while the patient is mildly sedated. The child can go home the same day of the surgery.